We are a full service design firm providing consultations in Alpharetta, GA, from project concept to the completed installation. Our initial consultation fee is $150, with most consultations lasting between one and three hours, depending upon the scope of the project. The consultation takes place in the client’s home, and is the time for the client to communicate the inspirations , priorities and goals for the project. We will listen , question and take notes in order to create the dialogue that is essential to determine the vision the clients have for their home. During this visit time frames and budget will be discussed. Current furnishings , fabrics , style and colors will be identified so as to incorporate them into the plan. The Conceptual design plan(s) will be presented to the client at a further date in the design studio. A retainer fee is required for all of the floorplans , color selections and conceptual drawings. If a client continues to the ordering process within 30 days , 50% of the retainer is applied towards the proposed purchases. When the client agrees upon the plan, a 50% non-refundable payment of the contract initiates the ordering process. Prior to delivery/installation, the remaining balance from the approved “Contract” invoices and the balance on any authorized changes are due. The designer notifies the client of this amount in advance, so these amounts can be reconciled. The client submits the payment to their designer at least one week before their installation day. Additional items that may be needed to “complete” the look of the finished areas are placed in the home during the installation and a detailed list of these items is provided to the client on the day of the Install. These invoices are called “Install” invoices and are often equal to half of the value of the client’s “Contract” invoices. However, this amount is relative to many factors, including the amount of appropriate furniture and accessories already in the client’s possession. The client is not obligated to purchase any of the “Install” items. The client has two calendar days to review these items and notify the designer of those items they wish to purchase. Payment of these items is due within seven calendar days. Hourly fees are generally incurred by clients when time invested by the designer is needed for the following: concept drawing, CAD or hand drafting, bookcases, fireplaces, ceiling or wall treatments, and designer expertise for selections that are not purchased through Park Place Interiors. Project fees are incurred when designer expertise is needed to review or provide architectural design concept drawings, CAD and hand drafting such as construction design concept drawings, lighting plans, bookcase/fireplaces, wall treatments, ceiling details. Our goal is to give you a complete picture of how the process works, share our knowledge and experience in marketplace, with the objective of developing the look and feel that reflects your taste and home. 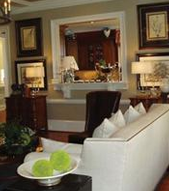 Contact us to request a service for design consultations and planning from Park Place Interiors in Alpharetta, Georgia.